A food diary is a real-time record of what is actually eaten, usually over a period of three days. A food diary is one of several methods for assessing a person's diet. Currently, there are several popular methods for recording a person's food intake. As well as using a food diary, there are other methods such as completing a 24-hour food recall and a Food Frequency Questionnaire. No one method is a perfect solution and each has its pros and cons. To complete a food diary, you record all the food and beverages consumed over a set time period. Commonly three consecutive days (two weekdays and one weekend day) is used, sometimes just one day. The consumed items can be measured using a scale or other household items, such as measuring cups or spoons, or estimated using a portion-size guide (see instructions for completing a food diary). Following collection, the completed records need to be entered into a software program for analysis. Using a food diary provides a measurement of food types and quantity, and does not rely on memory to recall what has been consumed (such as with the food frequency questionnaire and the 24hour recall). Having the subject be responsible for recording their diet may also result in positive behavior change. The biggest problem with taking a food diary is under-reporting. Recording less than is actually consumed is very common - it can be on purpose, as people don't want to be known to be eating certain foods, or most likely people are just trying to recall what they have eaten and forgetting all the details. As the subject is recording food intake as it is consumed, there is a risk of them changing their eating habits in response. This method is also challenging to some people as they are required to accurately determine describe their food and estimate portion sizes. 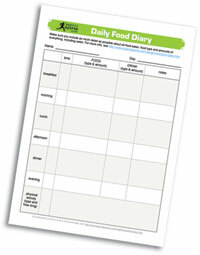 Download one of our free Food Diaries. See about having your food diary analyzed. instructions for completing a food diary.